Every nonprofit communicator wants an answer to this question! Why Does Email Frequency Matter? Because it’s so fast and affordable, email is a vital communications tools for nonprofits. The frequency of your communication can help or hurt your overall level of engagement with your supporters. You can’t expect them to stay interested, informed, excited, and responsive to your cause if you aren’t communicating with them about it. See my post earlier this week about who is and isn’t using email to keep donors informed. But if you communicate too frequently, or with lousy content, you’ll annoy people and they’ll unsubscribe or label you as a spammer. According to our 2012 Nonprofit Communications Trends Report, where we asked how often nonprofits planned to communicate in 2012 with supporters, 77% said they would email at least monthly (16% weekly or more often, 19% every other week, 43% monthly). Over the last month (August 2012), I’ve surveyed nonprofits again specifically about their email newsletters (not all email, just what’s considered a newsletter). This pie chart includes the 15.2% that say they aren’t sending a newsletter at all, leaving 56% of nonprofits to say they send their email newsletter at least monthly. If you remove the “no email newsletter” responses, then of those who do send an email newsletter, 66% are sending at least monthly (8% weekly, 11% twice a month, 47% monthly). Finally, if you look at the data from the 2012 eNonprofit Benchmarks Study, you’ll see that participants in that study, which are primarily larger nonprofits, send email weekly on average. 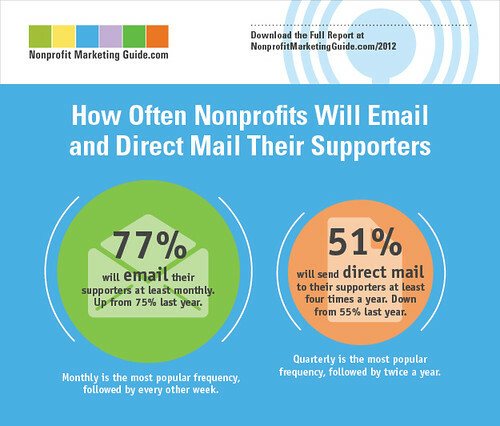 Check out this post for more Nonprofit Email Marketing Stats. Katya Andresen recently offered some great advice on determining your own email frequency on her blog. She encourages you to focus on segmenting your list so the right people get the right messages; to focus on their behaviors so you know what their interests are; and to incorporate testing and frequency caps. She says not to email people more than once a week except in very special circumstances. I love this case study from Amnesty International (although it is a few years old now) about how they analyzed their email frequency and the process they went through to tame unbridled email. Testing really is key — as is watching the right metrics. Jeff Brooks at Future Fundraising Now shared some interesting results from Which Test Won (a great site to test your own instincts). As Jeff reported, a travel industry e-newsletter compared sending shorter, more frequent newsletters to longer less frequent ones. The total amount of content was roughly the same either way. The less-content, more-frequency version got lower open and click rates, but much higher multiple opens and multiple clicks. It also got more purchases, revenue per contact, and less churn. Looking at opens and clicks alone, you’d think the longer, less frequent newsletter was the winner. But when you look at the actual results — more purchases and revenue per contact — the shorter, more frequent version won. I hope I’ve given you some information here to help you answer the email frequency question for your nonprofit. I’d love to hear your experiences in the comments!